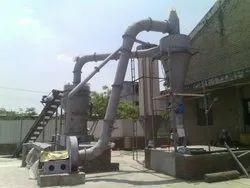 Offering you a complete choice of products which include 3 roller mill. The whole structure of 3 Roller Mill is composed of a rolle mill,Driving system, Classifier, pipeline device, blower, finished cyclone collector , jaw crusher, bucket elevator, electromagnetic vibration feeder, electric motor . the Raw materials by jaw crusher less than 20mm and lifted by the elevator to the storage hopper, then after vibrating feeder evenly and quantitatively and continuously into the Main machine grinding, grinded powder was blow by airflow away. Through the classifier separated, consistent with the powder fineness with air flow through the pipeline into the cyclone collector, were isolated and collected, and then by the powder in tube is discharged into the finished powder. Air flow from large cyclone collector is arranged at the upper end of the air return pipe suction blower. The air current of the whole system is a closed loop, and flow circulation in the positive and negative pressure condition. For Nonflammable,non-explosive and brittle materials With Mohs hardness less than 7.moisture content is less than 8%,. Such as :Limestone, calcite, fly ash, calcium carbide, kaolin, calcium carbonate, coal gangue, gypsum, grain slag, Mn ore, coal dust, bentonite, barite, marble, talc, refractory material.